Well it appears that this "announce you're opening date" week here at Sloopin. Monday was Baderbrau Brewery. Tuesday was Motor Row Brewing. Today isn't a brewery, but it does start with a "B" in it's name. We received an email from a reader stating that they have had some correspondence with a representative from Lakeside Bank and that they were shooting to open their new location at 14th and Michigan on Monday, February 23rd. 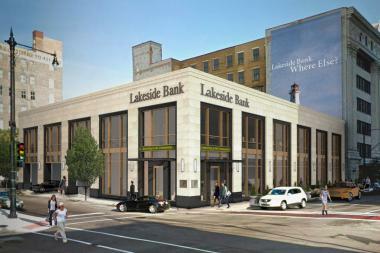 If you recall, Lakeside Bank ended up closing their location at Cermak and Prairie Avenue to make way for the McPier/DePaul arena/hotel. As a result, they ended up buying the vacant lot at the northwest corner of 14th and Michigan and have been in busy buildout mode since the fall.